The rooms have been named after winds, and a feeling has been assigned to each of them. Come discover your own feeling! The colors in this room vary from lilac to antique pink. Very bright, fully exposed to the Sun until sunset, in spring and fall best sunsets can be admired. The Mistral room has original furnishings from the early 1900’s wrought in chestnut and cherry wood. 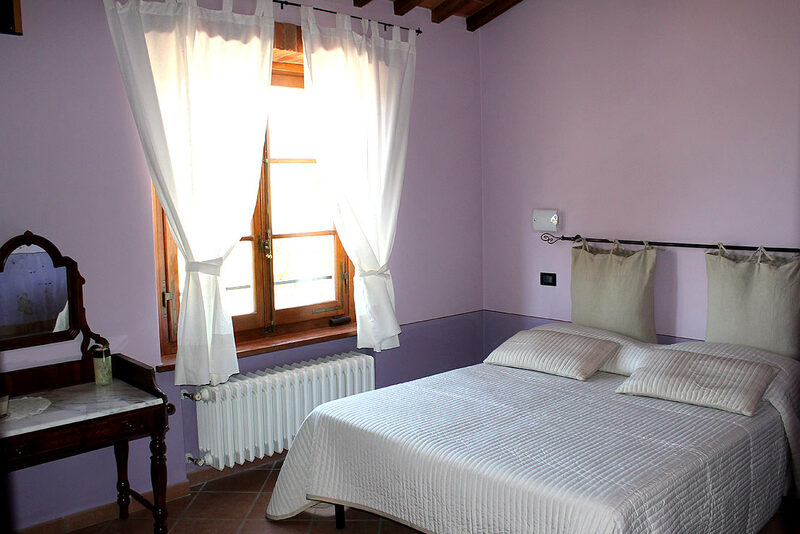 An open window renders a view over the town Montepulciano even more beautiful by night with the lights, and in the day the Siena countryside, vineyards, wheat fields and the wonderful-coloured hills changing after the seasons can be seen. The bathroom in the room has a modern furnishing with wide shower; heating plate, air conditioning system in summer. Libeccio is the celeste room. Two celeste hues endow the room with a certain warming; this room is very luminous because it is oriented towards sunrise; the view –equally beautiful—lays over the other side of the house facing the Umbria region. 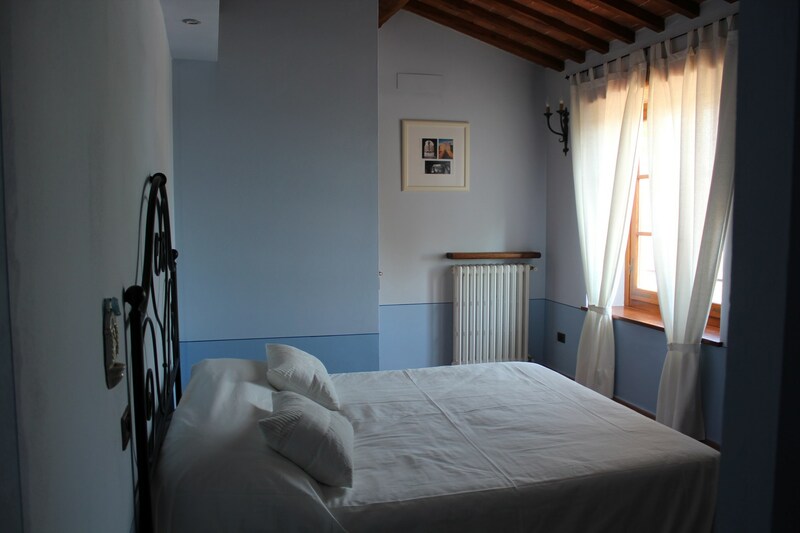 A bed with wrought iron, lamps and shelves handcrafted by the most famous smith from Pienza; wide bathroom in the room with Napoleonic tub; air conditioning system in summer and heating in winter. 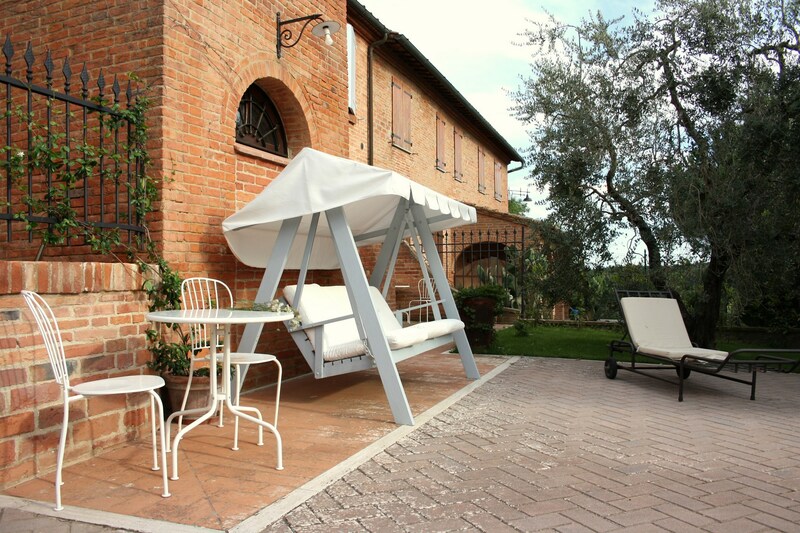 As you arrive in the property, you will find a large outdoor paved space, over the sides, small green gardens with olive trees and two cypress garden at the very front door. In summer the outside is furnished with rocking chairs and a hammock for you to relax and bask in the sun enjoying the tranquillity of the countryside to read or to listen to music; a small home-wood furnace completely renovated that hosted a family who baked bread for the whole week, and a little patio where you can eat and drink a nice glass of wine. Next, one gets to the rotunda where an awesome landscape can be seen. Walking down the stairs thereby a parking lot is located and from there you may watch the little vegetable garden, and orchard, and a hedge of olive trees whose olives, collected in November, produce the olive oil for the house consumption.